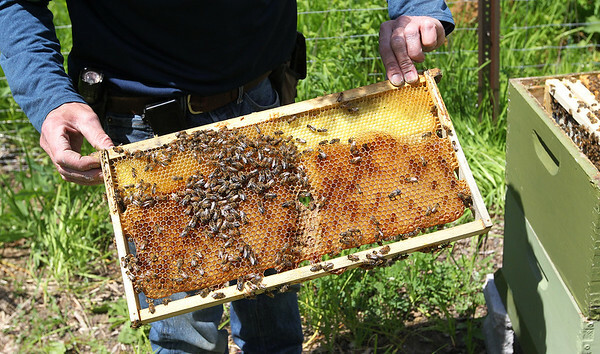 Candace H. Johnson-For Shaw Media Edward Popelka, of Spring Grove, maintenance engineer and resident beekeeper, looks at the drones, worker bees and female honey bees in a garden beehive in the apiary at the College of Lake County in Grayslake. 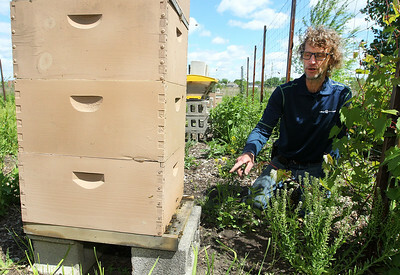 Candace H. Johnson-For Shaw Media Edward Popelka, of Spring Grove, maintenance engineer and resident beekeeper, opens the top of a garden beehive to check on the honey bees in the bee yard at the College of Lake County in Grayslake. Candace H. Johnson-For Shaw Media Edward Popelka, of Spring Grove, maintenance engineer and resident beekeeper, checks the honey bees at the entrance of a ten-frame Langstroth beehive in the apiary at the College of Lake County in Grayslake. 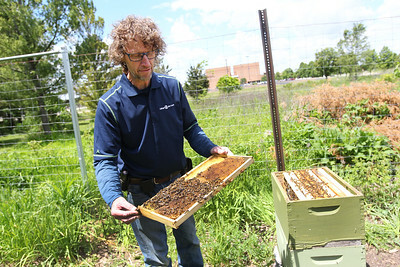 Candace H. Johnson-For Shaw Media Edward Popelka, of Spring Grove, maintenance engineer and resident beekeeper, holds a wax comb frame to observe the honey bees on it from a garden beehive in the bee yard at the College of Lake County in Grayslake. 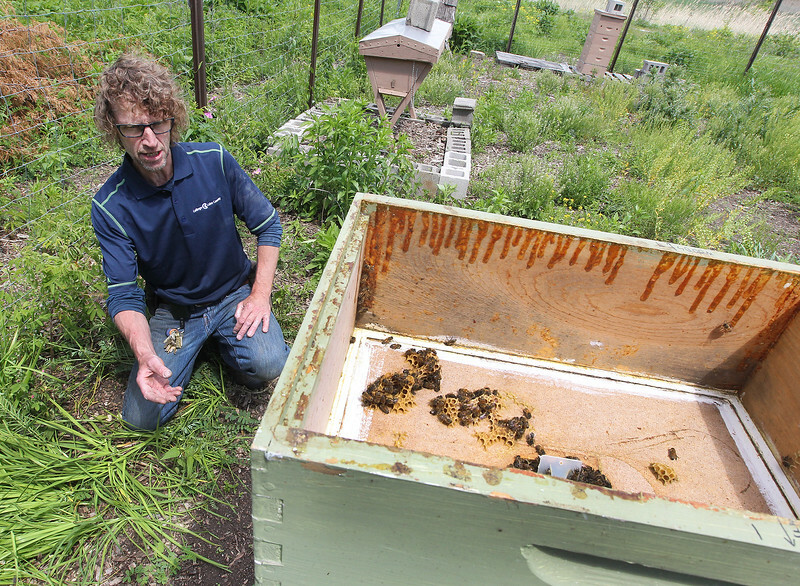 Candace H. Johnson-For Shaw Media Edward Popelka, of Spring Grove, maintenance engineer and resident beekeeper, observes honey bees at the entrance of a garden hive in the bee yard at the College of Lake County in Grayslake. Candace H. Johnson-For Shaw Media Edward Popelka, of Spring Grove, maintenance engineer and resident beekeeper, observes the entrance of a garden hive in the bee yard at the College of Lake County in Grayslake. 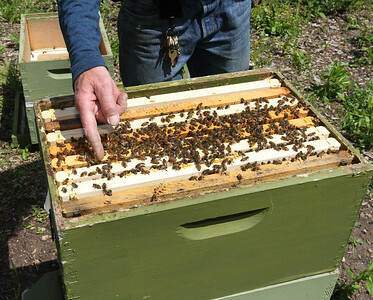 Candace H. Johnson-For Shaw Media A honey bee lands on Edward Popelka's, of Spring Grove, hand in the bee yard at the College of Lake County in Grayslake. 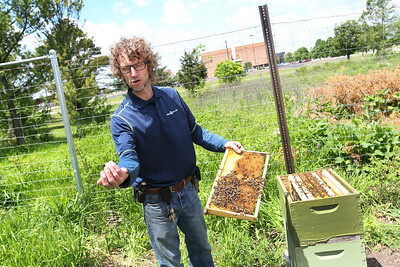 Candace H. Johnson-For Shaw Media Edward Popelka, of Spring Grove, maintenance engineer and resident beekeeper, shows off a male drone bee that has landed on him near a garden hive in the bee yard at the College of Lake County in Grayslake. 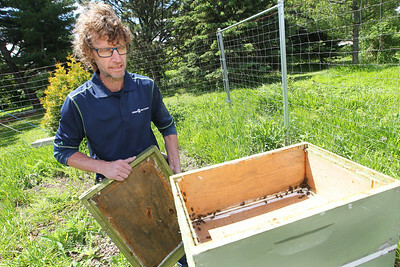 Candace H. Johnson-For Shaw Media Edward Popelka, of Spring Grove, maintenance engineer and resident beekeeper, holds and inspects a removable frame with hundreds of honey bees in a garden hive in the apiary at the College of Lake County in Grayslake. 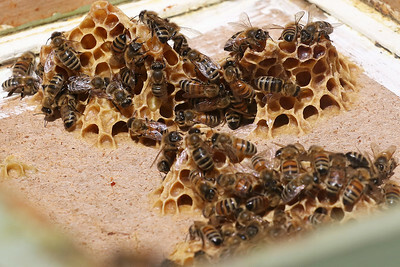 Candace H. Johnson-For Shaw Media A burr honeycomb with honey bees sits in a garden hive in the bee yard called an apiary, at the College of Lake County in Grayslake. 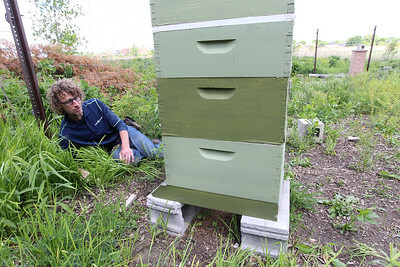 Edward Popelka, of Spring Grove, maintenance engineer and resident beekeeper, observes the entrance of a garden hive in the bee yard at the College of Lake County in Grayslake.